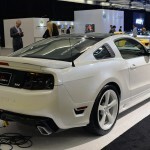 30th Anniversary 625HP SA-30 Saleen Mustang Limited Edition! This past week has been all about celebration. Namely, Saleen has presented its SA-30 Mustang limited edition, at the Los Angeles Auto Show, on the occasion of their 30th anniversary. The company has started its tradition by building a one-off prototype in 1988 and other one for the 25th anniversary in 2005. The SA-30 is a version that boosts power, pulling out 625 horses. So here we are, offering some fresh out of conference photos. 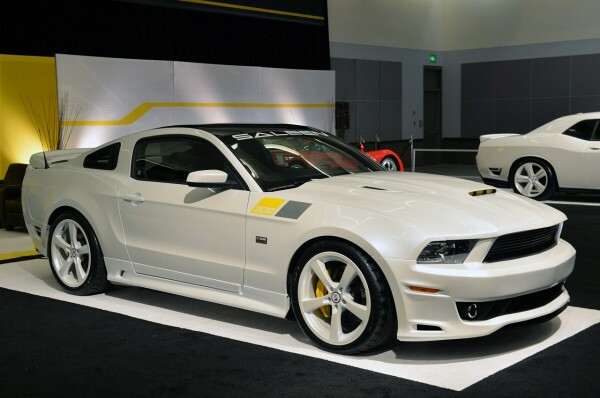 As you may know, the distinctive color mixtures of the Saleens have been yellow, black and white. The SA-30 is painted in Pearl White with black and yellow graphics. The interior has been amazingly equipped with optional Frost-Touch glass roof and rear window, floor mats, stylish Alcantara, white leather that covers what replaces the deck and the rear seats. 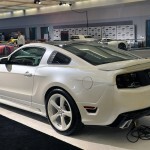 Finally, check out this retro Saleen Mustang!